The Sage 100 General Ledger Module allows users to streamline their bookkeeping and accounting transactions and produce customized reports through a customized or standard company set up. The fully customizable dual grid entry screen allows you to modify the data entry screens to fit your needs, making it easy to add and delete rows, move rows up and down, and change the values within the rows. The GL Module in Sage 100 allows you to use your current chart of accounts or choose one of over a dozen industry-specific options, further adding to the customization of your software. 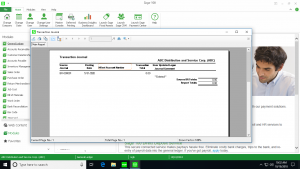 The Sage 100 General Ledger Module contributes to the powerful reporting capabilities of Sage 100 ERP, Sage 100cloud, and Sage 100 Manufacturing software. With its unlimited reporting capabilities, you can gain valuable business insight to make better business decisions. Create your own customized reports or choose from one of a dozen standard reports, including the General Ledger Worksheet, General Ledger Trial Balance, General Ledger Detail Report, General Ledger Detail by Source Report, Exception Report, Reprint Journals, Source Journal History Report, General Ledger Graphics, Budget and History Report, Account Audit Report, and Account Memo Printing. Sage 100 also allows you to create reports such as Trend Reports, Income Statements, Balance Sheets, and Statement of Cash Flow Reports. Flexible Chart of Accounts Structure – Choose from one of over a dozen pre-loaded industry-specific chart of accounts or create your own. Account Status – Keep your accounts current by assigning an account status (active, inactive, or deleted) and avoid accidental posting to closed or deleted accounts. Start/End Dates – Specify start and end dates for main or subaccounts. Roll-Up Codes – Utilize up to four roll-up types and unlimited roll-up codes for more reporting flexibility outside of your chart of accounts. Budgets – Develop an infinite number of budgets, which you can edit and maintain simultaneously. Batch Entry – Gain control over your general ledger account by creating public or private batches in Transaction Journal Entry and General Journal Entry. Flexible Accounting Periods – Specify end dates for up to 13 periods annually. Transaction Detail Drill Down – Utilize the drill-down capabilities to see the details in each transaction, or take advantage of the powerful search function to locate the data you need. Multiyear History Retention – Ensure your historical data is safe with up to 99 years of history retention or post information to future years. Nonfinancial Accounts – Retain nonfinancial information such as square footage, expiration dates, and head count for use in financial reports and allocation calculations. Allocation Entries – Allocate funds from a single source to multiple destinations based on a percentage allocation, a quantity, or based on a specified value from another account. Financial Statements – The Financial Reporting wizard allows users to easily produce Income Statements, Balance Sheet Statements, Cash Flow Statements, and Trend Reports. Business Intelligence – Sage 100 Intelligence Reporting allows you to gain valuable insight through the use of advanced reporting tools. Delete Accounts/Change Accounts – Modify account numbers without having to change individual transactions. One-Step Bank Transfers – Integrate with the Sage 100 Bank Reconciliation Module to enable transfers between banks in one easy journal entry. See for yourself what the Sage 100 General Ledger module can do for you. The Sage 100 consultants at Accounting Business Solutions by JCS can help you maximize your Sage 100 ERP, Sage 100cloud, or Sage 100 Manufacturing investment with our Sage 100 training classes, support, and data repair offerings. Call us today at 800-475-1047 today or email us at solutions@jcscomputer.com to see how we can make your Sage ERP software work for you.